The Valley Stream Union Free School District Thirteen’s James A. Dever Elementary School celebrated Youth Art Month throughout March with an environmentally-conscious theme. Students created unique artwork and also played a role in saving the environment by using recycled material for their artwork. The materials—including soda cans, bottles, newspapers, wire hangers and cups—were used by students in each grade to create unique masterpieces following a grade-specific theme. 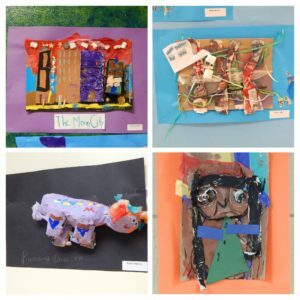 The kindergarten classes created self-portraits, the first graders made paper weavings, the second graders constructed cityscapes and the third graders crafted Oaxacan animals. Students in fourth, fifth, and sixth grade all created art that coincided with in-depth curriculum lessons—working in conjunction with students’ library research projects and lessons in art history. The District is always eager to develop schoolwide initiatives that serve to both further students’ curriculum and teach important methods of protecting the local environment.